have just one grand hotel. each with a role in history all its own. celebrities all signed the guest registers at one time or another. grand hotel, Wentworth By the Sea in Portsmouth reopened its doors in 2003.
completed in May 2003. This Grand Dame by the Sea was originally built in 1874. Russian, Japanese and American delegations. 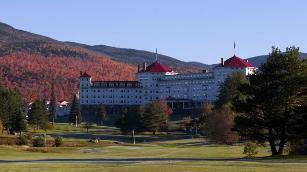 Washington hosted the Bretton Woods International Monetary Conference. rooms have been completely restored, and its lobby is a monument to a past era. largest downhill ski area at Bretton Woods. state-of-the-art European spa located in the tower atop the hotel.